Traditionally, computer users fall into two camps: they are either heavy keyboard shortcut users, or they primarily use their mouse or trackpad to click menu items and navigate tasks on their desktop. But with Keyboard Maestro, there’s a third, faster option: string stringers. 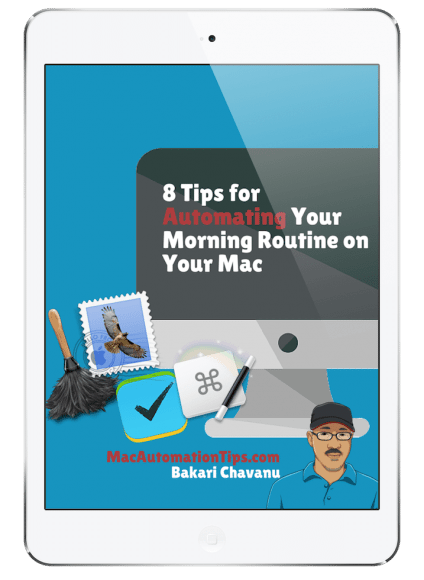 There’s no one right way to navigate your Mac, and most of us use a combination keyboard shortcuts and cursor clicks. But the fastest method for me are what are called string stringers. 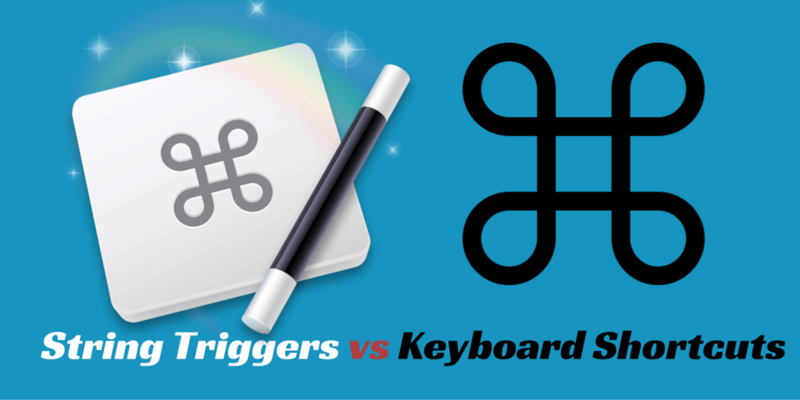 I’ve written about string stringers in several articles for this site, but I want to use this article to explain why and how string stringers are better than using keyboard shortcuts, especially when your hands already on the keyboard. 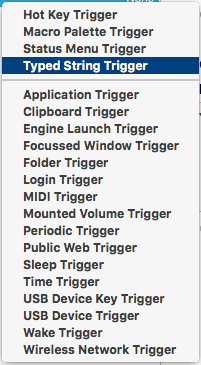 In Keyboard Maestro, there are several ways to trigger actions that you assemble into macros. 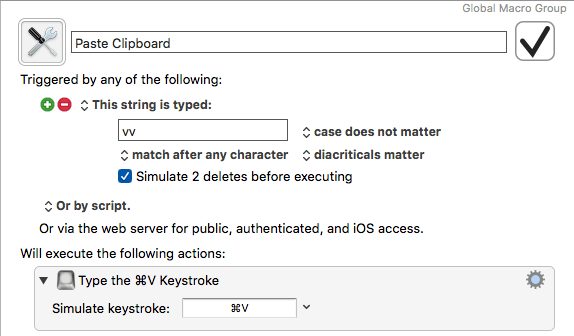 Actions can be triggered by keyboard shortcuts, by clicking actions in a macro palette or service menu, by launching or closing an application, and, among other methods, by typing two or more assigned characters. 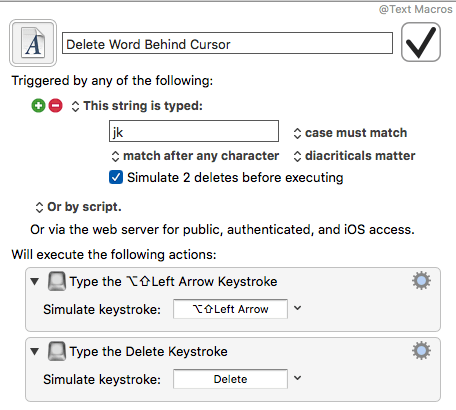 With string stringers you can actually type a few characters to launch an application, delete the last word you typed, scroll your web browser up or down, past text on the clipboard, lower or increase the volume on your computer, select and copy text, pause and play iTunes, and much more. 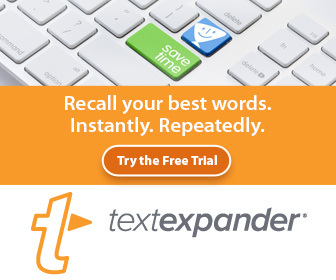 String triggers work similarly to text expansion abbreviations in programs like TextExpander. When your assigned characters for an action are typed, Keyboard Maestro automatically deletes those characters after they are typed and then runs the action(s) you set up in the macro. The following short demo is example of using a string trigger. The action executes fairly quickly. You’ll see that when I type the letters, “php,” the macro inserts () and then inserts the cursor between the parenthesis. After I type text in the parenthesis, I type the string triggers, “mv,” to move the cursor outside of the last parenthesis so that I can keep typing without looking down to hit the right arrow key. There’s no other program that I know of that allows for building string stringers the way it’s done in KM. If you’re like me, I can’t press keyboard shortcuts without looking down at my keyboard. I also have a hard time remembering the key combination for a particular action or menu item trigger; or most of the time, I simply don’t want to lift my fingers off the main keys to type the shortcut combination. Another example: With string stringers, I can simply type “vv” to paste text on my Mac clipboard, instead of moving my finger to the Command+V combination. Notice how easy it is to set up such a trigger. Another example: I find that even constantly using the Delete key can often slow me down. Because I type throughout the day, I hit the Delete dozens of times as I type. But I also type the string triggers “jk” to delete the last word I typed, which means I don’t have to punch the Delete key several times to delete a word. 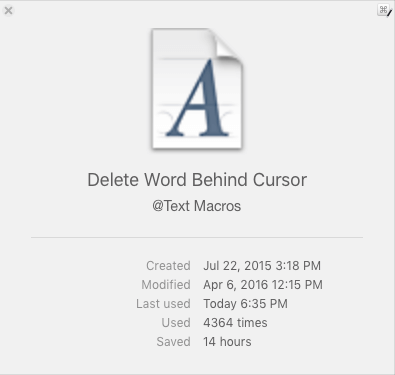 According to KM, I have used my Delete Word Behind Cursor macro 4364 times, and it has saved me 14 hours of typing in less than a year when I started using back in July of 2015. Now maybe the time saved is not accurate, but I do know that typing two characters is much easier than constantly hitting the Delete key. This macro simply simulates a keyboard shortcut, Option+Shift+Left Arrow key, to delete the word behind the cursor. If I had to take my hands off the main keys to type that key combination, it would require an additional hand movement and it would not be as quick as typing the string triggers. I use several other macros and string triggers to navigate text as I type, and those macros have made typing a little less cumbersome. And even better it has meant not having to tirelessly look down at my keyboard to locate keys, or move my hand back and forth to the trackpad. Though I still use keyboard shortcuts when from time to time, I typically create KM macros and BetterTouchTool finger gestures to trigger my most regularly used keyboard shortcuts and application menu items. 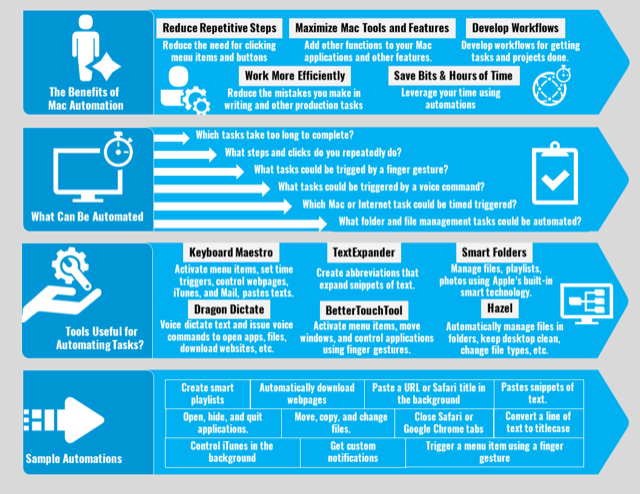 One study reports that using keyboard shortcuts could save save 8 entire workdays per year. Well, with string stringers, could foreseeably save typist twice or three times more workdays. I use dozens of string stringers while I work at my computer, and I rarely have difficulty remembering the combinations. My strategy for remembering string stringers is based primarily on two approaches: letters associated with the action it triggers, and key combinations that are easy to type, such as “jj,” “jk,” “jm,” “uu,” “nnd,” “vup,” “ddg,” and “cll”. I also find that, of course, the more I use a string trigger the easier it becomes to remember it. Unfortunately, string stringers are not built into OS X. So that means you have to build your macros and assign them triggers. Building macros does take time, and some skill, but it does not require knowledge of coding. Macros that trigger menu items, launch applications or web pages, or paste snippets of text often take less than a few minutes to build. And once a macro works the way you like, it can save you hours of time and clicking. If you’ve never used Keyboard Maestro, you can download a 30-day trial copy and create a string trigger as shown in the images above and in other articles for this site. Keyboard Maestro doesn’t have a very high learning curve, but it does take some time to learn to use all it powerful features. If you’re interested in learning more Keyboard Maestro, check out the category of articles published for this site. I’m also in the process planning an Keyboard Maestro course that will cover all the basic and advance features for using Keyboard Maestro. Be sure to subscribe to this blog to get notified about the prelaunch and launch dates of this course. 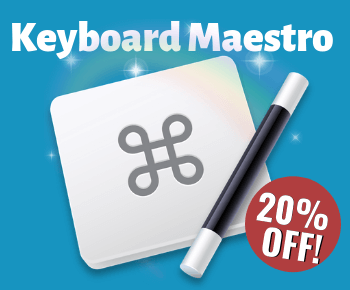 If you have questions about Keyboard Maestro, please ask them in the comment section below, or you can can post your question to Ask Mac Automator. It would be nice if you exported these macros so we could just import them into KM. Good idea, devananda, I’ll look into the best way to do that.